Click to download flyer in PDF format for printing or distribution. 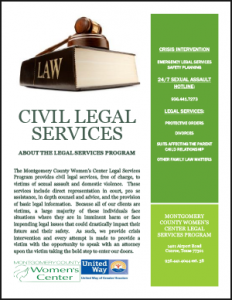 The Montgomery County Women’s Center Legal Services Program provides civil legal services, free of charge, to victims of family and/or sexual violence. 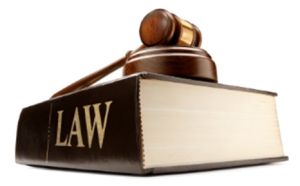 These services include direct representation in court, pro se assistance, in depth counsel and advice, and the provision of basic legal information. Because all of our clients are victims, a large majority of these individuals face situations where they are in imminent harm or face impending legal issues that could drastically impact their future and their safety. As such, we provide crisis intervention and every attempt is made to provide a victim with the opportunity to speak with an attorney upon the victim taking the bold step to enter our doors.